I struggle with not being heard. I think this all stems from two enemy attacks where humanity stopped listening to Him. In the Garden, Eve listened to the snake, and chose to act upon what she heard instead of believing the Word God had spoken to both she & Adam. Sure, humanity was new and maybe she wasn’t expecting an enemy to be hiding out in His Garden, but if God had often been walking closely with her (as the Bible indicates), she could have waited to ask Him before reacting so quickly. We sometimes listen to the opinion of others instead of clarifying things with the source, don’t we? But when communication suffered its next big hit? We originally had one language. There was a way to clearly communicate for all! Then the people decided to build their own legacy, instead of being thankful they were a part of His. As we reach for the stars, we have a tendency to forget to keep our eyes on their Maker. And sure enough, God came down & noted their plans. I find it interesting His comment in Genesis 1:6, because we know unity is important to Him, as it is part of His very being. I believe He recognized humanity would fast track itself into trouble if He didn’t step in and do something about it. For humanity’s sake, not His. And that is when God decided to establish many languages, and people were dispersed according to who they could still communicate with as a result. His original plan was one language, one people. We decided to change His plans. First in the garden when we started to listen to others, then at Babel when we decided to listen to ourselves. Babble occurs when we forget the lesson of Babel, and speak without wisdom. When we fail to communicate with Him. Yet, one Voice continued, and continues, to speak to them, to us, all. I believe this is why there are similarities that cannot be otherwise explained between the different languages. God left an echo of the One language in them all. So we would remember the Originator of all language. And why we ended up spread out across the world. The building didn’t stop in Babel. Countries have been trying to build their legacy ever since then. People craving power more than connection with their Creator continue to build on unsure foundations. ‘Look at me’ becomes humanity’s cry when we forget to look at Him. And the breakdown of communication? It will continue to occur throughout time & history as long as we stop listening for & to His Voice. As long as we keep listening to the enemy, ourselves or others as our primary communication sources, we will continue to flounder in our interactions. We will keep trying to build walls for our glory, and end up keeping others at arms length. For when we communicate we are all we need, others don’t feel the need to draw closer. We can end up unknowingly hiding ourselves behind these walls, not sensing how desperately we need God to speak the Word to break it down & set us free. 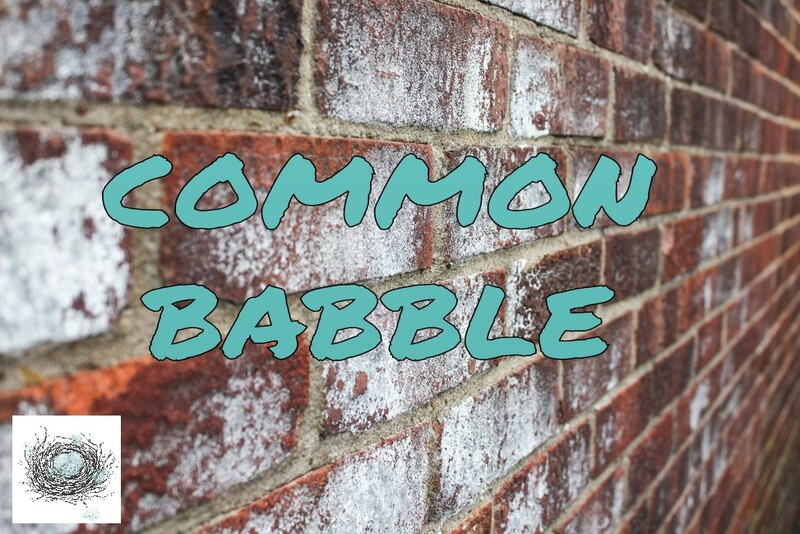 It’s time to rise above the common babble. Love one another with His heart. Speak what He has for us to share with one another. It’s time for the One language to become our primary tongue again, allowing Him to rewire our communication network as we seek Him. Let’s leave the building of temporary things behind, and communicate our desire to build His Kingdom instead.